When the sun sets, there is beauty and tranquillity to be enjoyed in our African gardens. There is a simple elegance and peacefulness in a garden designed to be at its best in the evening. It is a place where white- and pale-coloured plants take on an iridescent beauty, and where strong colours darken, adding a mysterious quality. A twilight garden need not be large. It can be part of the main garden, or situated near a patio. In this garden it is best if the design is kept simple and uncluttered, with well-lit paths constructed of light-coloured paving. A suitable focal point could be a small pool where moonlight is reflected in the water. White and stone urns, statues and benches are more visible. Whether you enjoy sitting on the patio or in your garden in the evening, there are many delights to be found in a twilight garden. 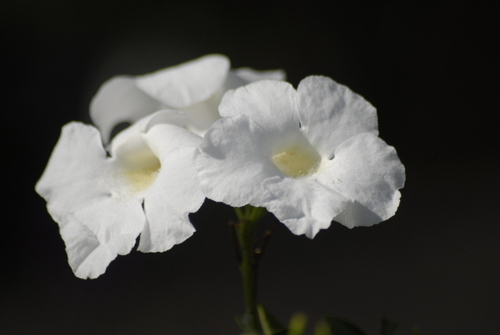 White flowers are most successful in evening gardens where they remain visible long after other colours have faded. Cream, lemon and pale pink flowers and light-coloured foliage are also useful for lighting up dark corners, remaining visible long after darker shades have merged with the shadows. The twilight garden can be attractive in spring with white flowering cherry, September bells (Rothmannia globosa), azalea, foxglove, iris, magnolia, narcissi, viburnum, and climbers Clematis montana and white wisteria. In summer, the garden is a most pleasant place in which to relax when the heat of the day has passed. 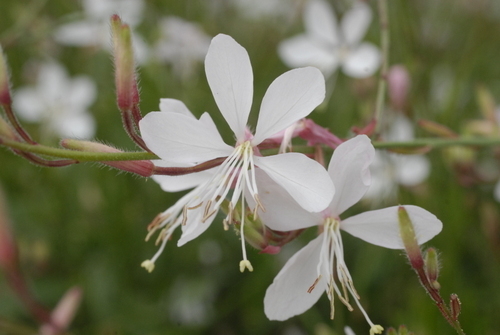 White flowers for the summer garden include agapanthus of varying heights, arum, mophead hydrangea, oak-leafed Hydrangea quercifolia with white panicles of flowers, and Hydrangea paniculata with cone-shaped flower heads that fade to dusty pink. New Guinea impatiens in shady areas. Bulbs with white flowers include the pendant bells of the Berg lily (galtonia) and fragrant pink and white tuberose. 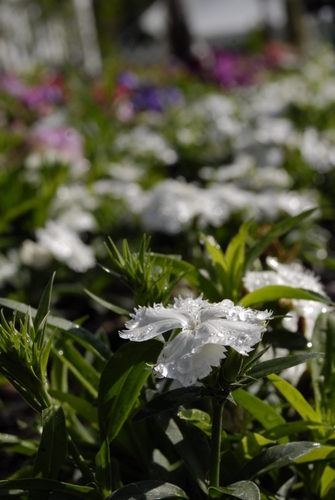 In autumn there is white alyssum, cosmos, dahlia, dianthus, white sasanqua camellia, chrysanthemum, nicotiana, roses and white and lemon petunias. In an evening garden, the foliage of caladium, variegated hibiscus and hosta show up well, as do silver and grey foliage plants of Artemisia ‘Powis Castle’,Festuca glauca ‘Silver Eyecatch’, Helichrysum petiolare, lamb’s ears (stachys), lavender, Lamium maculatum ‘Beacon Silver’ and santolina. Shrubs suitable for the twilight garden are the ‘alba’ form of plumbago, spring- to summer-flowering African dog rose (Xylotheca kraussiana), Freylinia alba, an evergreen shrub with small white flowers, Bauhinia natalensis with white bell-like flowers, and the silver leaves and clusters of dainty white flowers of Gomphostigma virgatum. 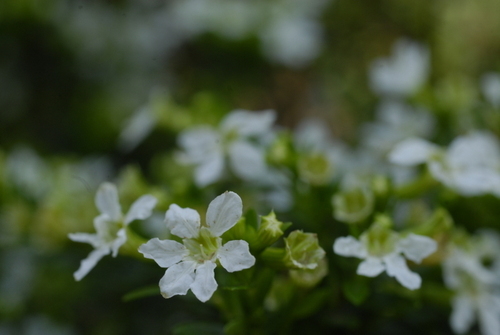 Fragrance plays an important in an evening garden. White flowers often attract night-time pollinators, not only because they are visible in the dark, but also because many of the blooms are scented, as seen in South Africa’s dainty epiphytic (tree) orchid Mystacidium capense with arching sprays of scented white flowers. 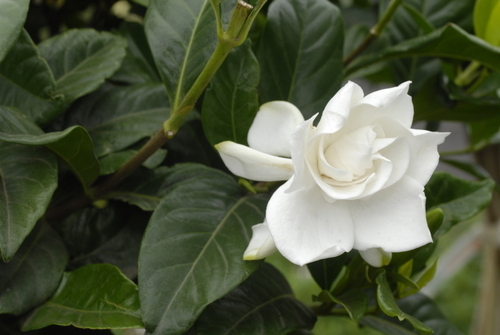 The scent of Choisya ternata, frangipani, gardenia, jasmine, honeysuckle, mock-orange (philadelphus), murraya, many roses, tuberose and viburnum will drift across the garden and onto patios and through open windows. Lilies are another favourite in the evening garden, for their elegant flowers and strong perfume. 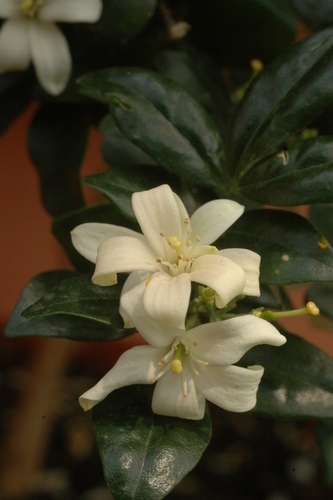 Sometimes flowers are insignificant but have a strong fragrance, such as the tiny sprays of white flowers of Osmanthus fragrans. 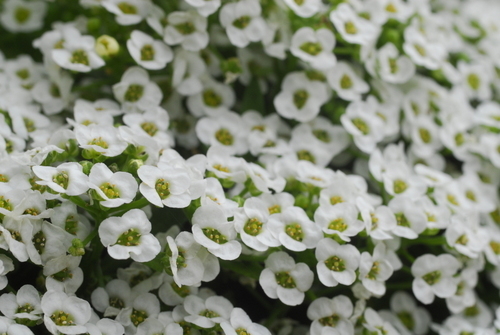 Alyssum has a delicate honey scent and is among the most useful of annuals for a quick ‘carpet’ effect. Use it in pots, to edge paths, and in-between the treads of steps and paving. Pillars and posts on patios offer vertical support for white-flowered climbers such as Pandorea jasminoides ‘Lady Di’ and star jasmine (Trachelospermum jasminoides). Fill containers with white alyssum, lilies, white and lemon petunias, dwarf white Marguerite daisies and white impatiens (shade), interplanted with plants with silver-grey leaves, as well as those with light-coloured foliage, such as Cuphea ‘Lemon & Ice’, Lamium ‘Silver Beacon’, and dwarf Gardenia ‘White Gem’.